Vintage seed catalogs are highly collectible items among gardeners, but also collected by people who collect advertising & catalog memorabilia. During the winter while searching for seed catalogs to request I came across the Smithsonian Libraries blog that periodically posts images of the covers of seed catalogs. 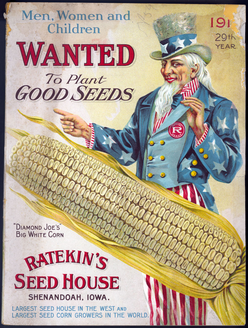 The cover for this Ratekin's Seed House catalog was posted on the Smithsonian Libraries blog for the 4th of July. That is a very patriotic cover but the placement of the ear of corn gave me a chuckle when I first saw it. I haven't found any information on what happened to the Ratekin's Seed House, except for this mention of a lawsuit over the quality of their corn. You can view the collection of seed catalogs posted at the Smithsonian Libraries blog here.